Medical imaging is one of the most powerful and affordable ways to accelerate the process of a patient's treatment. It helps caregivers to see the exact effect of their treatment on the affected part of the patient and plan further course of action. It also provides quality diagnostic support and aids in making critical treatment-specific decisions. This makes it important to outsource medical imaging services to an experienced service provider. Outsource2india is a leading provider of healthcare imaging services to global clients. 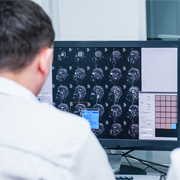 We have been working with clients across the globe and providing them with highly accurate, cost-effective, and professional medical imaging services. Our team is well-versed with all the latest medical imaging technologies. By outsourcing medical imaging services to us you can be assured of accurate and reliable services. Why Choose Us for Medical Imaging Services? Outsource2india is one of the leading providers of medical imaging services in India and a gamut of other healthcare BPO services including teleradiology to global clients. We have been working with hospitals, physicians, and other healthcare organizations for over 20 years now and have the required expertise to cater to any type of healthcare imaging requirements. Other teleradiology services we offer include 3D image processing, radiology information systems, etc. If you are looking for reliable, efficient, and affordable medical imaging services, then you have come to the right place. Get in touch with us.